Yangon (AsiaNews) – The campaign to suppress Christianity in areas controlled by the United Wa State Army (UWSA) in Shan State continues with crosses removed, three Baptist churches destroyed, 52 closed, 92 pastors arrested and 41 students forcibly enrolled. Myanmar's largest ethnic army also shut down a Catholic mission run by Salesian missionary nuns and ordered the latter’s expulsion. Rev Lazaru, a spokesman for the ethnic Lahu Baptist community, released a statement yesterday (picture 2) in which he denounces the rebel acts of violence near the city of Mongpauk. In it, he notes that dozens of clergymen were taken into custody, Baptist schools shut down and dozens of students, both male and male, forcibly recruited into the rebel force. To add insult to injury, the people who were detained had their heads shaved. Although the UWSA, in the statement announcing its action, used the Chinese term jidujiao, a word that applies to Protestants and evangelical Christians, and not tianzhujiao, used for Catholics, the latter were targeted as well. The hilly Wa area falls under the Diocese of Lashio, suffragan of Mandalay, and has no Catholic churches. However, at Mong Mau, some Salesian nuns teach and serve as healthcare providers to locals. Last Monday, Wa officials shut down the mission and expelled them. The Catholic presence in the Wa area is quite recent but very important, said Mariano Soe Naing, spokesperson of the Catholic Bishops’ Conference of Myanmar (CBCM) and head of the latter’s Office for Social Communication (CBCM-OCS). "Starting in Mong Mau, we built schools in three other locations along the border with China. This is not proselytising. We did all this for the good of tribal people even if there are no Catholics in the areas." "The Sisters were interrogated by the authorities for the first time on 9 September at their building. 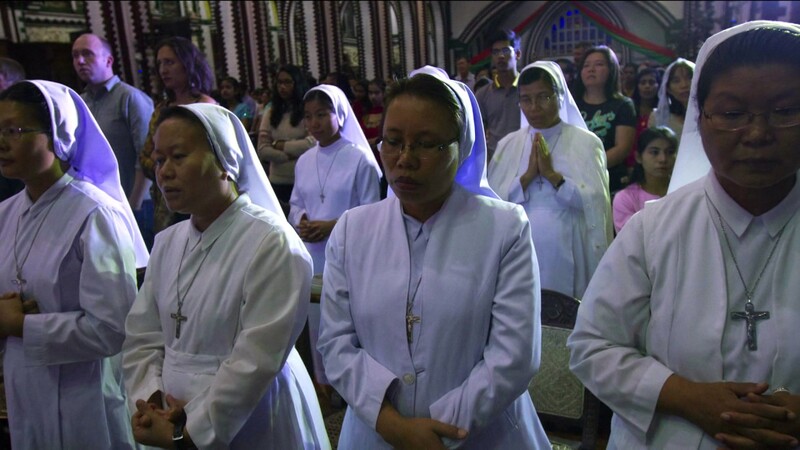 Once it was determined that the women religious were working only in the field of education, the officials let them go; in fact, they complimented their work,” Fr Naing said. All this happened when the first arrests among the Baptists were being carried out. On 16 September, local officials detained five young Catholics from other parts of the country who were helping the Sisters in the mission. "The young people were taken to the police station,” Fr Naing added. “The agents treated them well, did not harm them and after a few hours released them. On the 23rd, together with their personal belongings, they again took them to the barracks, where they spent the night. The following day, despite the opposition of local villagers, the youth and the nuns were ordered to leave Mong Mau and return to Lashio." "The authorities know who the Catholics are and what they do. They know that we do not want to convert anyone. Their behaviour is wrong. First, they invite us and then they throw us out without any explanations,” said the CBCB spokesman. For his part, Card Bo, archbishop of Yangon and a Salesian, visited the nuns on Wednesday. He celebrated Mass with them and listened to their stories.